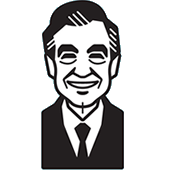 Copyright © 2006 Family Communications, Inc.
Fred Rogers spent his life leanring about children and families. His honest wisdom continues to offer special reassurance and support to parents whose children are grown, to those raising young ones, and to children of all ages. This inspiring collection of thoughts, observations, and anecdotes is drawn from Fred Rogers' lifework of communicating to children and about children. "Although children's 'outsides' may have changed a lot over the years, their inner needs have remained very much the same. No matter what lies ahead, children always need to know that they are loved and capable of loving." With a Foreword by Joanne Rogers, and sections titled What We Bring From Our Past, Growing as Parents, Many Ways of Loving Each Other, and Growing as Children, Many Ways to Say I Love You resonates with Fred Rogers' firm belief in the power of listening and loving and his special insight into the challenges of growing as parents and children.